A new large study on autism genetics just came out: Most genetic risk for autism resides with common variation. The study is in Nature Genetics, one of the top journals. No single autism gene. You might carry one or more genes which are associated with autism and not be autistic. But the more you have, the more your risk goes up. It may be linear: each variant has a “score” and you add them up and if your score is very high, you are autistic. Or it may be nonlinear: some genes in combination may create a greater risk than the sum of their individual risks. I don’t think they understand or have cataloged the genes well enough to say. What does this mean for the future of autism research? It means that continuing to look at both genetics and environmental risk factors is valuable. As I’ve said before, from my perspective if autism risk is 10% genetic or 90% genetic, you still need to apply resources to both genetics and environmental risk factors. Now to answer the more mundane questions. What does this mean for the vaccine epidemic? You can’t have a genetic epidemic (not really true, but good enough for this discussion)! This doesn’t fit with the idea that about 99% of autism is now caused by vaccines. Yep. These data are yet another reason why your idea doesn’t work. But isn’t this just blaming the mothers? I’m always amazed when that argument comes up on autism genetics. And, yes, it does come up. Your children’s genetic makeup is neither a source of pride nor of blame. You really didn’t have any say in the matter. You didn’t create nor change your genes, how can you be blamed for the genes that your child inherits? Won’t genetic research lead to aborting babies? Maybe. If it does, it will be much different than the current situation with Down Syndrome. Autism doesn’t have many examples of single-genes, as this study points out. There have already been groups claiming to be working on tests involving multiple genes and autism risk scores. Does this mean that the story is finished? That we have the last answer about how much risk is genetic and how much is environmental? No. There will be more papers and more estimates. These are tough questions and knowledge evolves. A key component of genetic architecture is the allelic spectrum influencing trait variability. For autism spectrum disorder (herein termed autism), the nature of the allelic spectrum is uncertain. Individual risk-associated genes have been identified from rare variation, especially de novo mutations. From this evidence, one might conclude that rare variation dominates the allelic spectrum in autism, yet recent studies show that common variation, individually of small effect, has substantial impact en masse. At issue is how much of an impact relative to rare variation this common variation has. Using a unique epidemiological sample from Sweden, new methods that distinguish total narrow-sense heritability from that due to common variation and synthesis of results from other studies, we reach several conclusions about autism’s genetic architecture: its narrow-sense heritability is ∼52.4%, with most due to common variation, and rare de novo mutations contribute substantially to individual liability, yet their contribution to variance in liability, 2.6%, is modest compared to that for heritable variation. ← Is Boyd Haley resurrecting OSR#1 as a chelator? That study really makes sense. Aside from the children who have been diagnosed with ASDs along with a known chromosomal/genetic disorder, most autistic children are quite unique i.e., (perhaps with a few similarities), but many more individual characteristics. That’s why autism in all forms and permutations are part of the “spectrum”. Excellent analysis Matt. Thank you. This seems to confirm some of the things researchers have been saying all along: If there were a single “cause”, it would have been uncovered by now. I did not pay for the complete article, so I am not sure how they distinguished “rare inherited” from “common inherited”. If my son’s genetic structure was not de novo with him, how did they determine that it was not de novo with me? I am also not sure how “common variation” squares with what we know about parental age. Does that mean that common variation works differently for older parents than for younger ones? Let’s say that a specific gene is found in many people. For most people it is the same. For some people, they have a variant of the gene (perhaps a missing bit or a duplicated bit), but among this sub-group, the variant is the same. That would be a common variant. Let’s say that a given change is never found in other people. Or only in a very few. That would be rare. I need to check on how they determine denovo. Is that a single person with a variant? I don’t recall if they checked the parents, but one would say a variant not present in the parents would be de novo. This article is hidden behind a pay wall but doesn’t look like they had a control group. 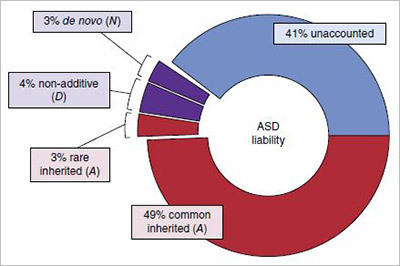 Many common genetic variants are associated with autism risk. Very few GWAS studies have ever reported the population prevelance of the common genetic variations. The first genetic studies implicating common genetic variants were found on chromosome 7 but how strong are these risk factors? Not very much. ‘Several genetic variants have been associated with increased risk for autism. The variants found so far are mostly associated with differences in the metabolism, rather than in brain structure. The MET promoter variant rs1858830 allele “C”, found at increased rates in autism, is associated with neuronal growth and development, but also is involved in immune function and gastrointestinal repair. The fact that this genetic variant is present in 47% of the general population gives credence to the assertion that there is an environmental component to the development of autism. Many of the genetic variants at increased prevalence in autism are associated with the folic acid, transmethylation and transsulfuration metabolic pathways. Some of these genes are MTHFR, COMT, GST, RFC and TCN2. As with the MET variant, these are common in the general population. These variants decrease the activity of enzymes and decrease the efficiency of the body’s ability to resolve oxidative stress, methylate genes and detoxify exogenous and endogenous toxins’. A rather strange dismissal of this study. What you fail to account for are the confluence of several gene variations present and an environmental influence at a particular time, likely during gestation given the evidence found in several other studies. It will be interesting to see other large scale genomic study results and whether replication can be observed but I’m not dismissing this for the weak reason you stated. An excellent rebuttal to this study. And it has nothing to do with vaccines. That isn’t a rebuttal. But thanks for the link. Genetic links to autism and epilepsy are extremely under researched and completely ignored in medicine. Warning: DO NOT use VALPORIC ACID (DEPAKOTE), PHENOBARBITAL or Tylenol—- if the patient has abnormal ANK3 (Ankyrin-G nodes of ranvier) variant. Doctors don’t routinely test for this genetic marker in seizure patients so beware! For instance, if an autistic patient with EPILEPSY develops abnormal behaviors while taking any of these drugs a genetic test should be done to rule out ANK3 de novo missense mutations! Better to use CBD strains of medical cannabis, Vitamin D, Selenium, Lamictal and Racetams like Keppra. Hmmm… that information was not available to us twenty seven years ago! Perhaps not even two years ago when this article was written. Of course, we cannot assume your statement is accurate until you provide the PubMed indexed studies by reputable qualified researchers. Especially for the claims made in the last sentence. Landigan . What causes autism? Valproic acid, thalidomide, rubella, insecticides. Are known to cause autism by what mechanism? More environmental testing especially for for fetal development. Also genetic deletions and or duplication shank 3 but what causes this. What common denominator for mothers such as working dental or nail technicians etc.